A few months ago, She asked our friend Cindy Young if she could make a quilt for Scarlett's mermaid-themed room. And did she ever! It seems that Cindy's quilting group went to town on the design we found and months later, this piece was delivered. It reaches from just behind Scarlett's crib to the very tip top of our 9 foot ceilings. It is incredibly detailed with mermaids lounging on coral, a dolphin, seahorse, turtle and a myriad of fish. Each layer has different textures that make the water look as though it is in motion. Every creature has an different expression or personality. And it matches everything we had already done so well, it looks like it was always there. When we found out we were having a girl last year, we immediately began dreaming up a fun bedroom. I had always thought an underwater theme would be fun, but when I saw this mermaid print, my mind was set (and I promised Chris that our next child could have the outer space room that he wanted). I started collecting ideas and we have been working on it ever since. Our house has very colorful walls (much to our landlord's chagrin - sorry dad!) so the turquoise was a perfect fit. This print used to be over the crib. The lamp was in our living room for years. Scarlett (with some help from me...) made the bunny when Build-A-Bear came to the oncology department a few months ago. The tiny key hooks were too cute to pass up, even if they can't hold much. The purse was from Gymboree...I waited months for it (and the outfit that matched!) to go on sale! Last year, my kindergarten class collected books for us to begin a baby library, which we are still working our way through. We have a strange collection of Mr. Potato Heads, so when we saw a mermaid at Walgreens, we had to have it. And my old iPod found a home here, too! Chris' favorite part of the room are these jellyfish we hung in the corner. Thank you to Cindy and the wonderful quilters who helped to make the finishing touch to Scarlett's room! We're hoping she can enjoy this room for a few years (or until she decides she only likes ballerinas or monster trucks or black walls or something!). What a beautiful room! That quilt is AMAZING, a real testament to the craft. Love the quilt. What a special thing to have. Weird question, but where did you get the bookcase in Scarlett's room? What a stunning quilt it looks great in her room! The bookcase is an EXPEDIT from Ikea on its side. It fit perfectly under the window sill, and can be used later upright or in combo with others from the collection. Oh my goodness, that quilt is gorgeous! The whole room is so fun! We have the same bookcase in our younger daughter's (11months) room. Doubles as her changing table! Love it! Wow, Cindy and Co! that is an awesome piece of cuddly art. Very cool! And I love the whole room. 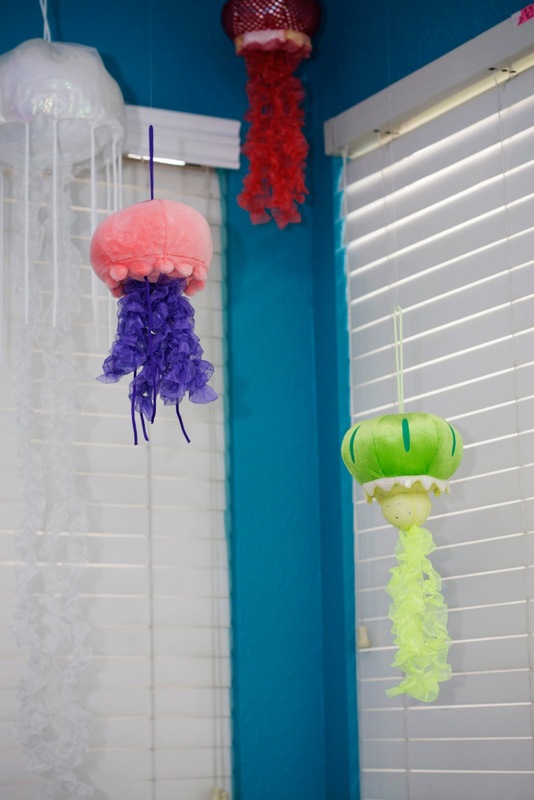 The jellyfish are so perfect. The quilt is amazing! What talent those quilting ladies have! how sweet of your mom to think of that for a gift for Scarlett! Love her mermaid themed room and the uniqueness of it! Great Idea! so beautiful. Her room is perfect. You did such a great job on it! I absolutely LOVE her room!!!! I love everything about it, esp the wall colors- my house looks like a crayon box threw up with all the different brightly colored rooms. I also think my daughter has the same crib as Scarlett only in black (DaVinci brand?? )Love the quilt, it's apparent that much time and love went into it! Such a beautiful and unique room! That quilt is amazing. What a beautiful room, I can't believe the detail on the quilt, it is amazing. I had to LOL at you remark about an outer space room, that is what my husbands idea for the nursery was too! I love the mermaid room, it looks like a fun, happy environment for Scarlett. That is beautiful! You know you are going to be getting a lot of ocean stuff now right?